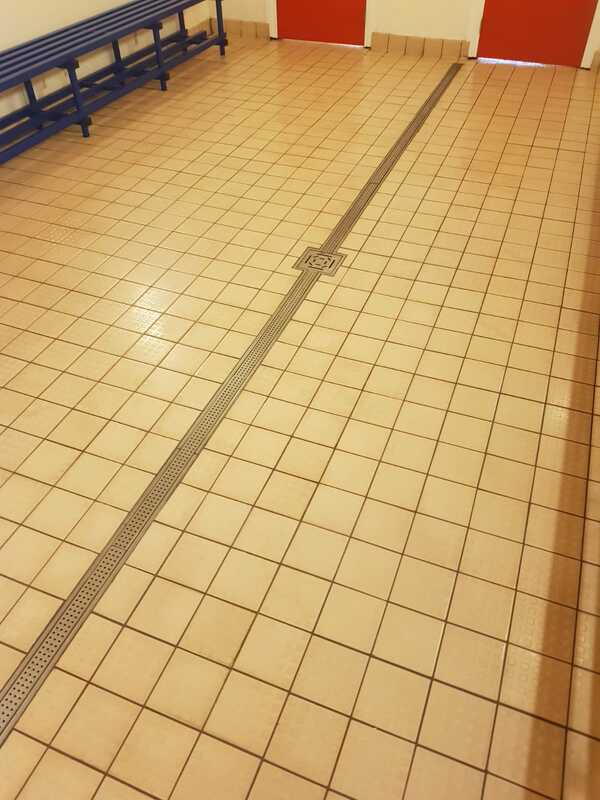 The management team of a swimming pool located in the historic market town of Bishops Stortford asked us to pay them a visit recently to see what could be done to improve the appearance of the ceramic tiles in their changing rooms. 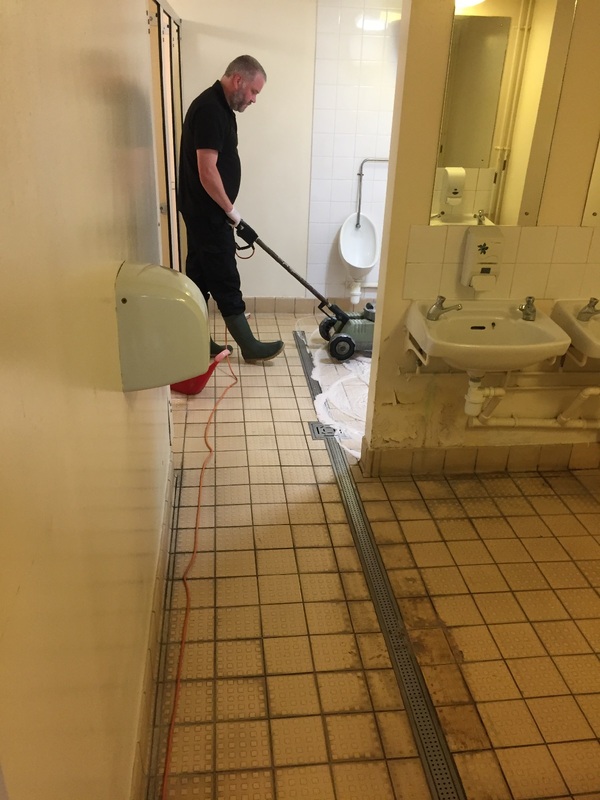 We usually find commercial buildings rely on their own cleaning teams and so we are used to only getting called in when they have been struggling to resolve an issue. 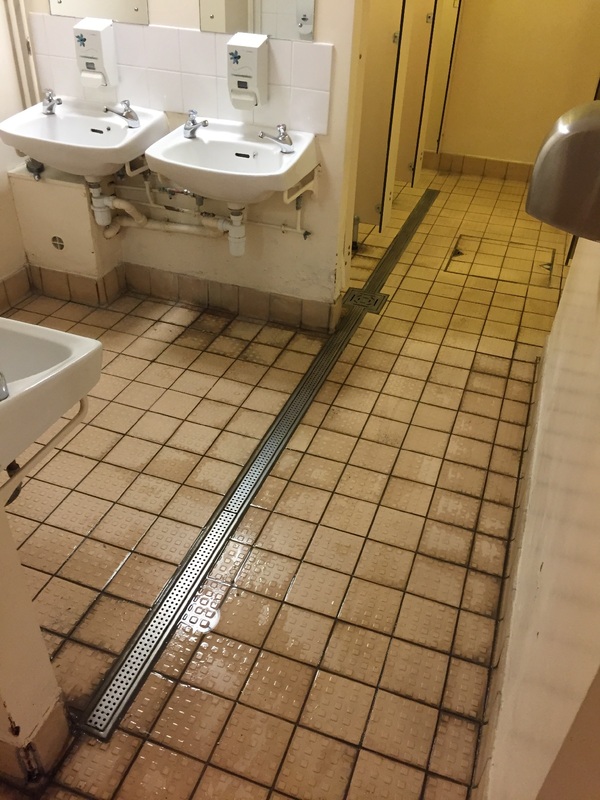 In this case the floor tiles in the changing room were anti-slip ceramics which due to their rough texture are very popular in wet areas such as these. Working in sections, our first task was to apply a strong dilution of Tile Doctor HBU to the dry tile surface and allow to dwell for 30-45 minutes. HBU stands for Heavy Build-Up and this product uses tiny Nano sized abrasive particles to lift out deeply ingrained dirt from tile. After allowing the product to soak in it to the dirt it was then agitated with a slow speed 110v orbital rotary scrubbing machines fitted with 3m polypropylene cleaning pads. We use a 110v machine through an isolating transformer to provide maximum electrical safety when working in wet areas. 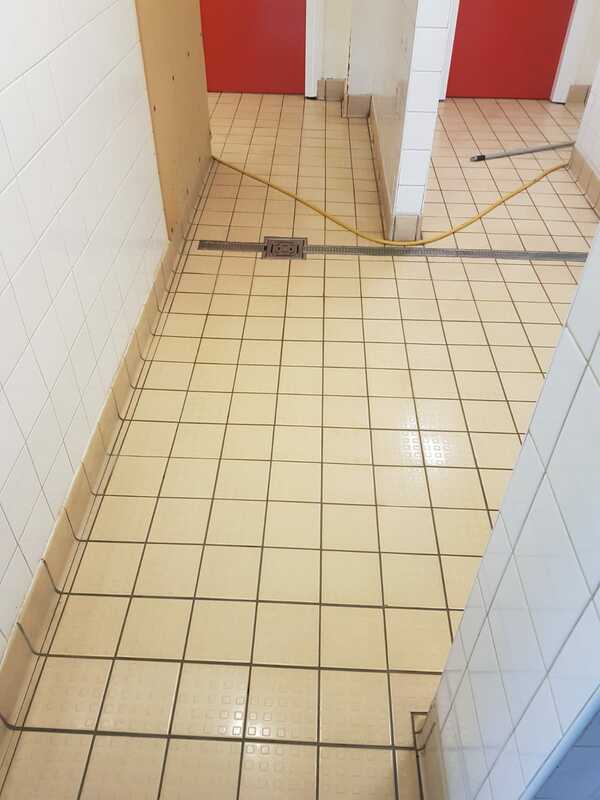 The grout lines and other areas that were difficult to reach with the machine were then scrubbed manually and then left to dwell for a further 30 minutes whilst we continued working in another section. The floor was then given another scrub and the now dirty cleaning solution was rinsed off the floor with water and then extracted with a 110v wet vacuum. With the floors looking much cleaner from the deep clean the next step was to apply a similar process to the white ceramic wall tiles where the grout was also looking grubby. Tile Doctor Oxy-Gel works best on wall tiles, it’s a strong tile and grout cleaning product that comes in a gel form which sticks well to vertical surfaces allowing it to dwell and work on the dirt longer. It’s a similar process in that you apply the cleaning product, allow it to dwell and then scrub it into the surface; this work had to be done by hand using stiff brushes. Once done the tiles were rinsed and then treated to a steam clean and machine buffed with a six-inch soft white buffing pad fitted to a handheld buffer. The tiles in the toilet stalls were also given similar attention using a combination of the processes above. 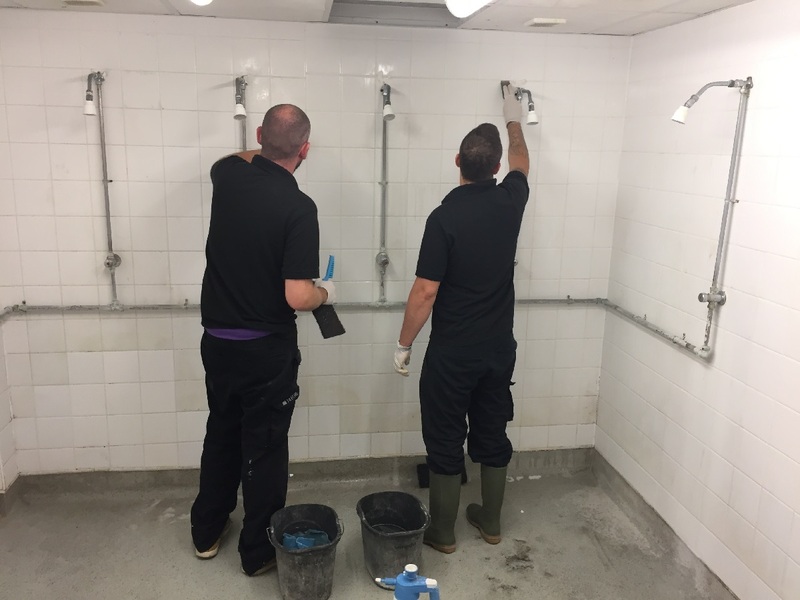 The whole job took two days and the tiles now look far cleaner and give the changing room a far more appealing and hygienic look. Naturally our client was extremely happy with the result.